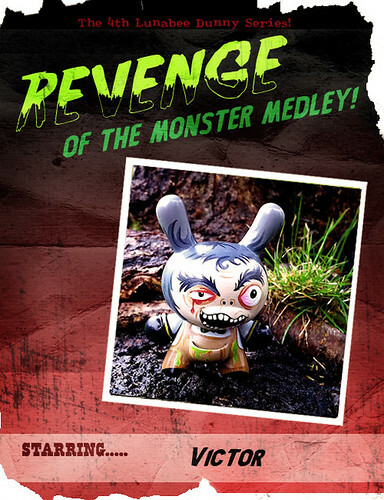 Lunabee: custom vinyl toy art: REVENGE OF THE MONSTER MEDLEY : Victor Revealed! REVENGE OF THE MONSTER MEDLEY : Victor Revealed! New Dunny series coming this Wednesday on the Lunabee store! The third reveal is Victor, a mad scientist with dreams of bringing monsters to life, Lady Frank being his favorite creation to date. Victor's manic laughing can be heard far and wide as lightening strikes the tower where he lives in the dead of the night..
1/1 handpainted 3" dunny from the 'Revenge of the Monster Medley!' dunny series. REVENGE OF THE MONSTER MEDLEY!